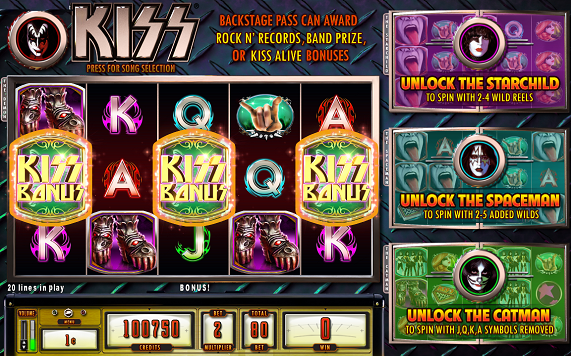 KISS have unveiled a new video promoting their slot machines. The band unveiled the product line last fall at the 12th annual Global Gaming Expo (G2E) in Las Vegas. The slot game offers players unique features for multi-array games, as players can be awarded one, two or three bonus video reel sets on any spin, each enhanced with WILD symbols added to the reels or the low-credit symbols removed. Additionally, when three or more bonus symbols appear on the reels, players will be awarded a Backstage Pass. Players then can choose from one of three passes that may award the Rock n' Records free spin bonus, Band Prize Top Box Bonus or the KISS Alive! Bonus. The KISS slots are currently available for playing in several states and casinos across the U.S.